So Wednesday was San Francisco. The morning dawned cool and misty, in fact it was trying to rain. 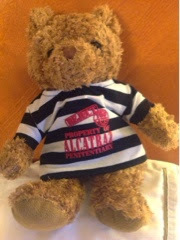 Blogger Bear (on loan from Bigfashionista) dressed the part...he's not sure if he looks cool, cute or silly. 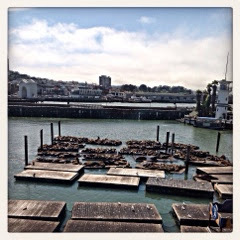 We stopped for lunch after the trip, sitting on pier 39 admiring the sea lions as they squabbled and basked. Looking black and sleek when wet but cuddly furry and brown when dry. We spent some time first listening to the cable, discussing how the cable cars work, no engines or motors, with the cable always moving in the street etc, so all very informative and educational, and then the stroll.. Unfortunately hitting "rush" hour...so that was fun, we took the top down in the car and just patiently crawled out of the city over the Bay Bridge. Two hours later we were at the hotel, grabbing a McD to eat in bed and watching crime shows on tv. Next, the long drive south down I5.